Today was such a beautiful day out. After breakfast, hubby and I ran our errands for the week. It was a gorgeous day to be outside. This evening I prepared us a quick and simple dinner. Youngest son was home for dinner. 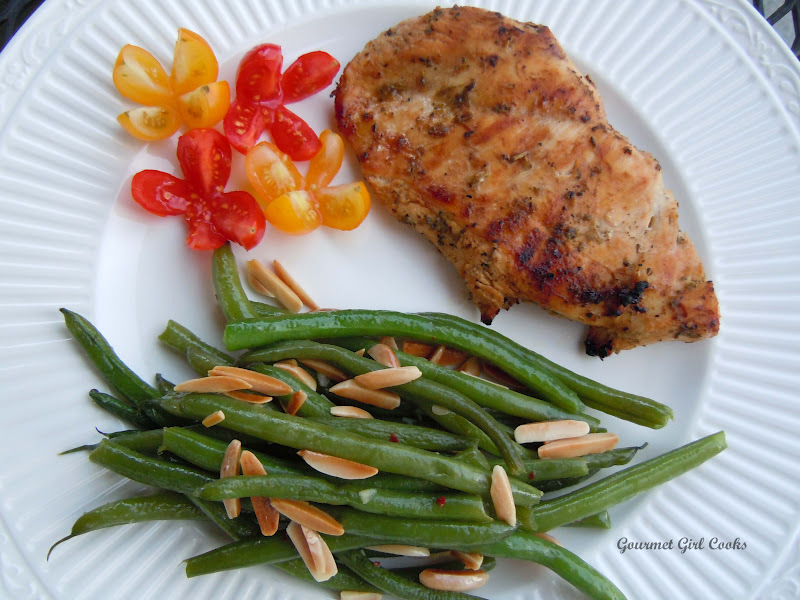 We had Lemon-Lime Marinated Chicken and Spicy Fresh Green Beans w/ Almonds. Hubby and youngest son also had brown rice with their meals. The nice thing about making marinated chicken is that you can marinate it ahead of time, either earlier in the day or the night before and then just toss it on the grill and it is cooked in 15 minutes or less, depending on the thickness of your chicken. The spicy green beans are also easy to do. I washed and snapped the ends off of about 1 pound of fresh green beans and minced a couple cloves of fresh garlic. I put a little olive oil in a wok and lightly stir fried the garlic and then added the green beans and about 1/4 cup of water, covered and let it steam for about 5 minutes (keep checking to make sure the water doesn't evaporate -- you do not want a lot of water as they are not supposed to boil and become water logged). As the water cooks off, add a little at a time until the beans are close to the tenderness you prefer (I make them crisp tender, similar to Chinese style). Once they are the tenderness you like, remove the lid and stir-fry until all the water is gone. Stir in about 1 tablespoon of olive oil. Season with salt and red pepper flakes, to taste. We like it a little spicy. Add toasted slivered almonds and toss. I snapped a photo for you to see below as well as the recipe for the Lemon-Lime Marinade. Enjoy! In a small bowl, whisk ingredients together; pour in a large Ziploc bag and add chicken and seal bag, removing as much air as possible. Marinate for 4 hours or overnight. Grill chicken approximately 5-6 minutes on each side, or until done. Remove to a plate or platter and cover with foil and let rest 5-10 minutes to retain juices.